Reading and share top 8 famous quotes and sayings about Fated Love by famous authors and people. 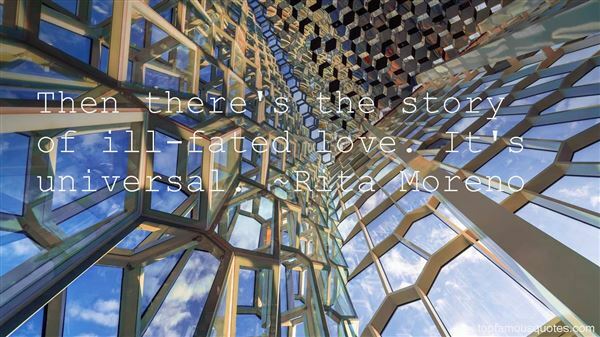 Browse top 8 famous quotes and sayings about Fated Love by most favorite authors. 1. 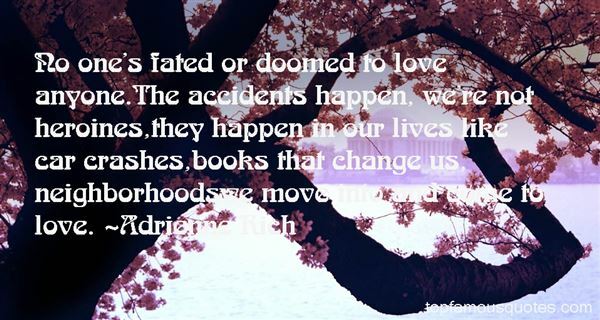 "No one's fated or doomed to love anyone.The accidents happen, we're not heroines,they happen in our lives like car crashes,books that change us, neighborhoodswe move into and come to love." 2. "Each of us is born to follow a star, be it bright and shining or dark and fated. Sometimes the path of these stars will cross, bringing love or hatred. However, if you look up at the skies on a clear night, out of all the countless lights that twinkle and shine, there will come one. That star will be seen in a blaze, burning a path of light across the roof of the earth, a great comet." 3. "I seem fated to pass through the world without colliding with it or moving it — and I'm sure I can't tell you whether the fate's good or evil. I don't die — I don't fall in love. And if other people die or fall in love they always do it when I'm just not there." 4. "The ancient sanskirt legends speak of a destined love, a karmic connection between souls that are fated to meet and collide and enrapture one another. the legends say that the loved one is instantly recognised because she's loved in every gesture, every expression of thought, every movement, every sound, and every mood that prays in her eyes. the legends say that we know her by her wings - the wings that only we can see - and because wanting her kills every other desire of love. the same legends also carry warnings that such fated love may, sometimes, be the possession and the obsession of one, and only one, of the two souls twinned by destiny. but wisdom, in one sense, is the opposite of love. love survives in us precisely because it isn't wise." 5. "We are fated to love one another; we hardly exist outside our love, we are just animals without it, with a birth and a death and constant fear between. Our love has lifted us up , out of the dreadfulness of merely living." 6. "Love affair. Doesn't that sound so middle-aged? And also ill-fated. Like ill-fated is an understood prefix to love affair. Well, ill-fated is fine, as long as it's a meaty and fraught ill-fated love affair, not a pale and insipid one." 7. "Then there's the story of ill-fated love. It's universal." 8. "I was falling in love with her, and she was falling in love with me. It was fated, decided before any of us were born, and I hated it as much as I loved it. I could barely stand it. (Eric)"
The lovely Hazard girls', they used to call them. Huh. Lovely is as lovely does; if they looked like what they behave like, they'd frighten little children."